Extend the life of your drill bits and save your company lots of money! Pricing starting as little as $10.00 per drill bit …. same day service available. T51 – 89mm Drill Bits currently re-sharpening price $15.00 per bit …. includes salt bathing at no extra cost if required. 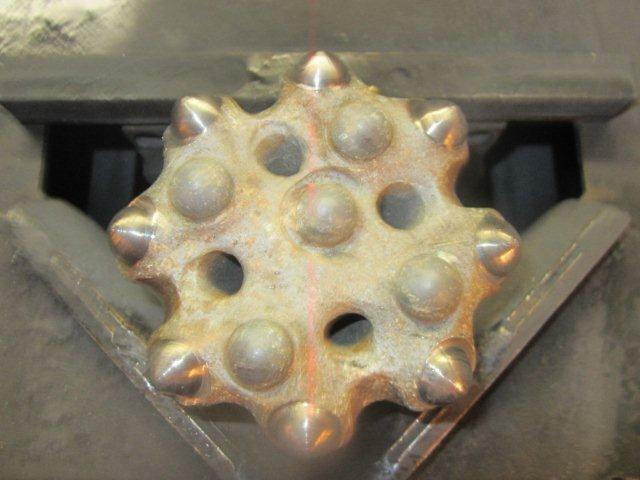 T51 – 102mm Drill Bits currently re-sharpening price $20.00 per bit ……. includes salt bathing at no extra cost if required. Currently using new CME Electric Drill Bit Sharpening Machine & Salt bath Machine. Don’t use your drill bits once and throw them out. They can be re-sharpened up to 10 – 15 times (depending on use). We currently have clients from local mining/drilling companies, Boral and Holcim Quarries who use our Drill Bit Sharpening services. Drill bits are processed through our salt bath machine first. It removes badly worn surfaces from the drill bit prior to re-sharpening, the result is a lot better. The drill sharpening machine is located in our workshop at Haigslea, Ipswich. We have clients on the Gold Coast and North of Brisbane that arrange couriers to drop off and pick up. Turnaround can be 24 hours for smaller quantities and 1-3 days for larger orders. Our Drill Sharpening machine is capable of sharpening a variety of sizes including large Hammer Bits. Contact us today to arrange to have your drill bits sharpened.